If you’re searching the phrase “full service gas station near me” or “gas stations that pump gas for you“, Bridwell Automotive Center is the full service gas station for you! Get directions to Bridwell Automotive Center at 7171 E Lincoln Dr. Scottsdale, Arizona 85253 or give us a call with any questions you may have at (480) 948-4781. BRIDWELL HAS THE ONLY FULL SERVICE GAS STATION REMAINING IN ARIZONA! Back in the day, all gas stations were full-service. The first self-service station opened in California in 1947, and the idea caught on across the country. Other than Bridwell Automotive, you will only find a full service gas station in Oregon and New Jersey, where is it mandated by law to continue doing things the old fashioned way. WHAT IS A FULL SERVICE GAS STATION YOU MIGHT ASK? A full service gas station is a gas station that has a filling station attendant that pumps your gas and performs other services. A filling station attendant is a worker at a full-service gas station who performs services other than simply filling up your gas and accepting payment. Fill station attendant tasks usually include pumping fuel, cleaning windshields, checking vehicle oil levels and more. All of this can be found when you bring your car to Bridwell Automotive Center. We are proud to offer Sinclair Gasoline! Sinclair is another family-owned company, American-owned and operated, sourcing the bulk of its supply from the United States. Now that you know just how great, and rare, full service gas stations are in this era, we invite you to come on over and let us serve you the old fashioned way! 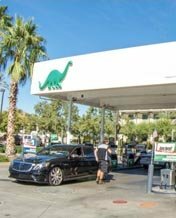 Let our filling station attendants pump gas for you at our full service gas station in Scottsdale, Arizona. Not only will you leave with the gas you need but peace of mind that your vehicle’s fluid levels and tire pressures have been checked. Learn more about Bridwell Automotive, our top-notch auto technicians and the values that have made our automotive center grow and thrive. Get directions to our full service gas station at 7171 E Lincoln Dr. Scottsdale, Arizona 85253 or give us a call with any questions you may have at (480) 948-4781. If your searching the phrase “full service gas station near me“, Bridwell Automotive Center is the gas station for you! Get directions to our full service gas station at 7171 E Lincoln Dr. Scottsdale, Arizona 85253.